Diagram of Interrupted (every metre) line transect 1 through the wetland. 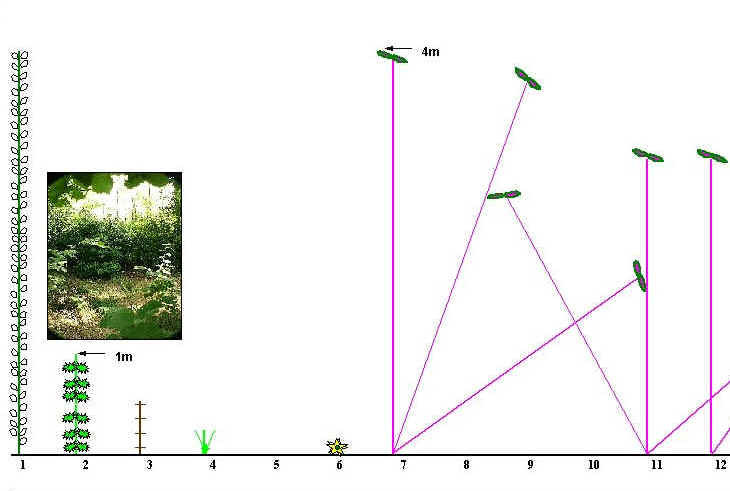 The diagram below illustrates the plants which touched each metre mark along the transect line. 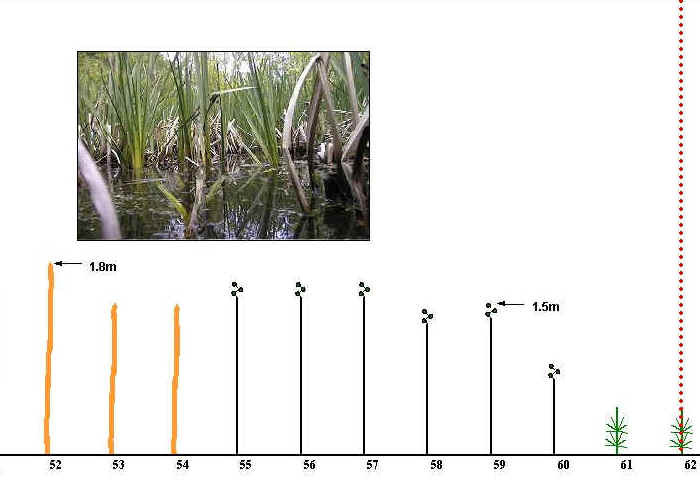 Click here for an overview of the transect position in the Wetland. This transect is marked by the red line on the photograph. The diagram above clearly shows the plant zonation pattern across the wetland. At the northern-most end of the transect, species which prefer drier land predominate. This includes species such as Nettles, Brambles, Rhododendron, Silver Birch and Alder. The Rhododendron which used to dominate this area prior to restoration (Historical Background) still dominates this marginal dry land zone (7-21m mark). The marsh area adjoining the dry land zone prevents the Rhododendron from encroaching further, but it is easy to see that if the wetland were allowed to silt up to any extent, the Rhododendron would once more rapidly cover the area. The trunks of Rhododendron can stretch virtually horizontally, above ground level, for many metres. It is therefore possible for the roots and main trunk of the plant to be on acceptably dry land, while the rest of the plant canopy reaches well out into adjacent marshy areas. This means Rhododendron plants are capable of extending their zone of dominance well beyond suitable ground conditions. The marsh area closest to the dry land zone (22m-30m) contains small Rhododendron and Silver Birch seedlings. However, the area is too wet for them to compete successfully here. Soft Rush is common in this region. Further into the marsh area (approximately 31m - 46m), species such as Willow, Yellow Iris, Water Mint, Wood Clubrush, Branched Bur-reed and Reedmace predominate. 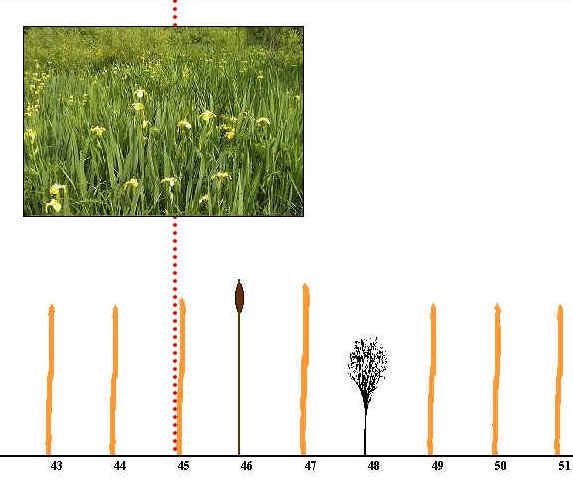 As the water becomes deeper, most of these species begin to die out, leaving Yellow Iris to dominate. 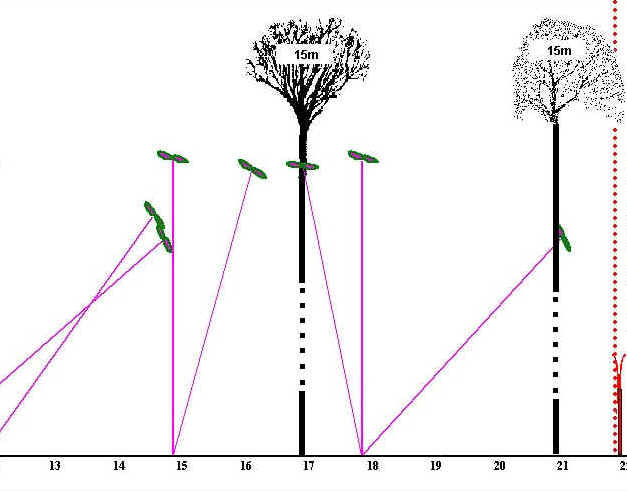 The continuous line transect is valuable in that it does pick up most of the species present in the transect area. 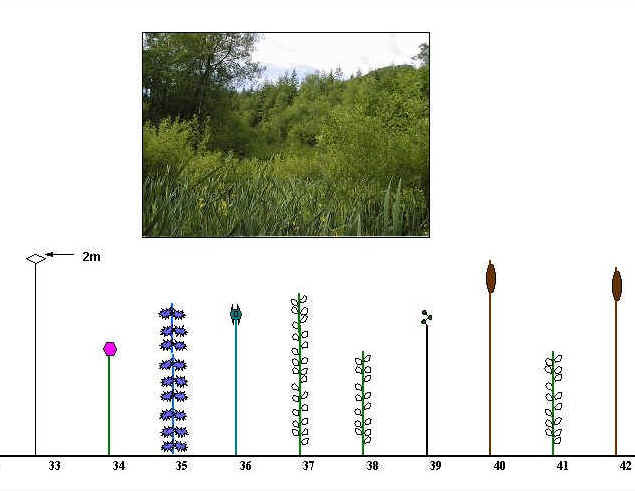 Twenty nine plant species were found on the continuous line transect, whereas only sixteen were recorded on the every metre, interrupted N/S transect. 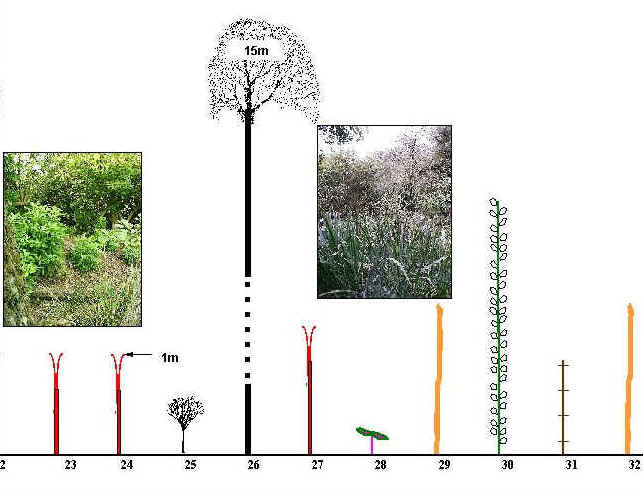 However a great number of plants have to be diagrammatically represented along the line for the continuous line transect. This makes the illustration quite difficult to look at and extract information from. There is a great deal of 'clutter' taking the eye away from general patterns of distribution. In contrast, this interrupted line transect where records were taken every metre, very clearly shows the patterns of plant zonation. This is because a lot of the less dominant species have been removed from the picture. The disadvantage with this line transect interval of one metre, is that it is likely to underestimate the range of each species. (The range of a species is the total region through which it occurs along the line.) It may, at times, even miss a fairly dominant species entirely from a particular region (see Water Mint on the E/W 1 metre interrupted line transect). As records are only being taken at every metre mark, plants will only be recorded if they happen to touch the line at the right point. The range of a number of the more important plant species distributed along the North/South line transect is shown here. This diagram was derived from the continuous line transect data, for the reason noted just previously.